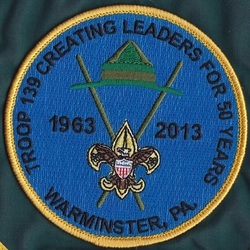 The Troop is sponsored by the First Presbyterian Church of Warminster. We thank them for their support which will enable us to continue helping so many young men. It is required for ALL BSA registered volunteers, regardless of their position, and must be renewed every two years. It should also be taken by those parents going on Troop outings. The letter from Committee Chairman can be found under RESOURCES. The Parent’s Orientation Handbook is now available under RESOURCES. If you are a parent of a visiting Webelos, a Den Leader or Cubmaster, we urge you to review so you can learn all about Troop 139. In addition, all should review our Code-of Conduct and Cell-Phone Policies. As of January 1, 2012 the process and workbook for an Eagle Service Project has changed. The new form is totally electronic and is a PDF that can be found under the FORMS section. Do not commence on working on an Eagle Project until you have discussed with your Scoutmaster. Did you borrow a merit badge book from the Troop Library or perhaps bought a new one for camp this summer? If you are done with the badge, please donate it as keeping an inventory of books holds down cost for families! Let Us Know When You’re Email Address Changes! "The more responsibility the Scoutmaster gives his Patrol Leaders, the more they will respond." YOUNG MEN BETWEEN THE AGES OF 10 1/2 AND 18 YRS OLD. LOOKING FOR PERSONAL GROWTH AND ADVENTURE ! !